1. Quit doing yoga, and instead FEEL it. Get rid of your notes and file cards that tell you how you should look, feel, be. Tap in to what you’re actually feeling while you’re moving, breathing or meditating. This is not to suggest that study isn’t important, but sometimes we need to get out of our heads and into our own body-mind-spirit. For many reasons, this will take you deeper on every level…mind-body-spirit. Exercise physiology research reveals that moving in a slower, more conscious way actually requires more muscle fiber firings….that is, it takes more work….than quick action/reaction movement. Going slower also allows you to become more “feelingful” (see #1 above) and more present which affects our neurophysiology in a positive way. Going slower helps us become more aware of our breath and allows for optimal exchange of oxygen/carbon dioxide. Going slower helps us to stay within our edges and avoid injuries. Experiment with transitions, roll around on the floor with your children or pets. These intuitive and spontaneous movements will take you out of your set pathways and broaden your range of possibilities. Experiment with breathing style, too. How does it feel to inhale in a forward bend and exhale in a backbend? Try classic asanas from different orientations to gravity (e.g. handstand, crow tree pose on your back). Playfulness opens you up to new possibilities and teaches you to be more open-minded in all arenas of your life. Set each day with an intention of when, where and how you want to practice. Check in on the intention throughout the day to see how intention and action are synchronizing. Review at the end of the day. Most likely, your intention and action weren’t totally in sync. However, find one good thing you did towards your intention…maybe it was just setting the intention in the first place. Soon this connection between finding the good in what did happen…and your goal-setting will provide you with intrinsic motivation to keep trying. 5. Keep it real! Do less during your session, more throughout the day. This goes along with #4. 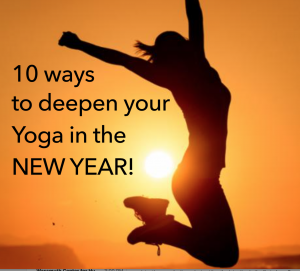 Set an intention for your yoga practice that is a small step, a shorter period of time or with fewer poses than you’d “fantasized”. This of course, makes it more doable. However, find time throughout the day, not only to review your original intention but also to reflect on how yoga’s limbs can be integrated into your activities of daily living. Twist mindfully at your desk chair, take a few moments to breathe consciously while waiting in line, extend loving-kindness to other drivers while running errands…..and my favorite, pick one yama or niyama a day and notice how it weaves throughout your actions. 6. Don’t compare yourself to others…. or even to yourself. Know that every day is different. Every body is different. Risk trying a new asana or playing with one that you thought you didn’t like or that you couldn’t do. 8. Lose the all or none attitude. A few minutes in Tree pose is way better than nothing. A little every day is better than one long bout each week. 9. Begin and end each session with meditation. Even if it’s only for a moment or two. This doesn’t have to look any particular way (you don’t have to sit in lotus with your eyes closed, savasana doesn’t have to be laying flat on your back). During the beginning meditation, bring to mind loved ones who will benefit by your practice and dedicate the practice to them. At the ending meditation, express gratitude to yourself for taking the time. ….all of these ideas will most likely make it more fun, but maybe there’s something out there that isn’t listed here. Make fun playlists, find comfortable and inspirational yoga wear…..attend yoga festivals, buddy up and yoga with friends. We all have different ways of having fun! Find what works for you.